I had the opportunity to join bloggers Caroline on Crack, H.C. of LA-OC-Foodie, John of Social Domain and Lizzie of FoodSheThought for a Small-Batch Social at Ammo Restaurant on La Brea. The tasting featured Santa Barbara-based Telegraph Brews and Christina Perozzi – the “beer chick.” Ammo provided the food portion of the pairings, which on the menu carried more weight as you moved down the menu but really could be mixed and matched to any of the four Telegraph brews. Formerly a strictly catering company, Ammo has enjoyed success to the point of expanding to first a restaurant, and then renting out the neighboring space to expand that restaurant. The simplicity seems to really work for them. The lighter bites included a red endive topped with Humboldt Fog goat cheese, toasted walnuts and wild honey; also House-cured salmon with crÃ¨me fraÃ®che on cucumber. Both were refreshing as the Humboldt Fog was a light goat cheese with the perfect amount of gummy. The mini Gruyere grilled cheese sandwiches, though, were probably the favorite of everyone’s the entire night. The toasts were the perfect thickness and grilled to a good crisp whereas the cheese had a delicious kind of buttery taste…and just a tad bitter. Now like most of you, I’ve eaten a lot of grilled cheese in my life as a cheese-and-toast-lover and I have to say confidently that this was right up there with the best. Now for the beer: Telegraph’s Golden Wheat Ale was a welcome first. As a light beer it held its own because it was peppery yet refreshing since I could taste some citrus. After the Golden Wheat came the California Ale which was earthy yet subtle. Their Stock Porter, however, was my favorite. It had a lot of body but also spice. 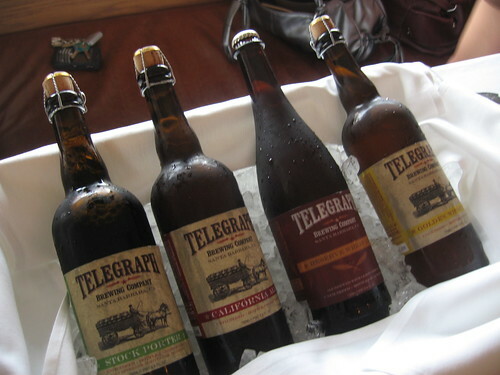 Overall, I was really impressed with the Telegraph beers. They were all great beers to enjoy food with because none of them – even the dark beers – were overpowering and had good flavor with multiple notes in each of them, especially the Stock Porter. This entry was posted in Food, Mid-City West and tagged ammo restaurant, beer tasting, brewing company, la brea, los angeles, small batch social, telegraph beer, telegraph brewing company. Bookmark the permalink.